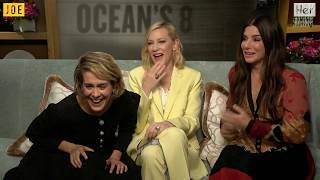 In the upcoming heist film “Ocean’s 8,” Sarah Paulson and Cate Blancett are two members of a stellar lineup of female stars – and in a live TODAY interview, they are irrepressible comedians, trying to upstage each other. “Can we talk about the movie? Anything but her,” says Blanchett. They make Hoda laugh so hard her mascara runs, and Savannah comes running in to the rescue!